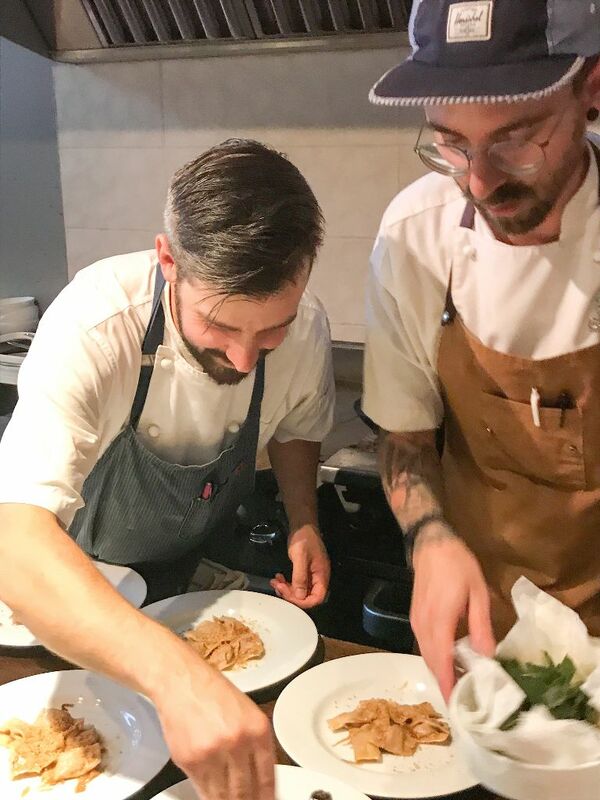 It may have taken until June for a restaurant in Edmonton to host the first Taste Alberta Prairie on the Plate dinner of 2017, but it was certainly worth the wait. On Wednesday June 28, 2017, Chef Ryan Hotchkiss and his team at Bündok delivered a stellar meal highlighting ingredients from a number of commodity groups that make up Taste Alberta including Alberta Canola Producers Commission, Alberta Pulse Growers, Egg Farmers of Alberta, Alberta Pork, Alberta Chicken Producers, and Alberta Milk. The 38 seat restaurant opened in January at the base of the Fox Tower on 104th street in downtown Edmonton. From the outside Bündok is unassuming; the restaurant is slightly hidden next to the construction going on at the Fox and there is no sign for the restaurant – merely a logo printed on the door. But step inside, and patrons are treated to beautifully plated dishes with complex flavours served from an open kitchen. After my first meal at Bündok, I couldn’t wait to ask Chef Hotchkiss to participate in a Taste Alberta dinner; his introductory menu was already highlighting the best of what is raised, produced, and grown in Alberta. For his Prairie on the Plate dinner, Chef Hotchkiss and his culinary team planned for a four-course menu; however, when we arrived, I learned we were to be treated to a two-dish amuse bouche, one inspired by a same-day delivery from the guys at Meuwly’s Secret Meat Club. Our first bite of the night was Bündok’s house-made bread topped with fava beans, grilled asparagus and Meuwly’s andouja sausage. Pork and pulses are a great combination, and the andouja sausage provided a spicy little kick to the dish. Each table also received a bowl of pomme dauphine stuffed with Sylvan Star Gouda. Sadly, this gluten free girl couldn’t indulge in the second starter from the kitchen; however, my portion had no problem being lapped up by the rest of my table mates. Chef Hotchkiss and his team took their time meticulously plating our first dish. Layer upon layer resulted in a dish made with hand-peeled Gull Valley Greenhouses tomatoes and a Reclaim Urban Farm mustard green salad, topped with Vital Green organic dairy farm crème fraiche, Highwood Crossing cold-pressed canola oil, a Gull Valley roasted tomato vinaigrette and croutons. The second dish was a clear favourite of the night from everyone at my table. Chef Hotchkiss served up a Sunworks Farm chicken liver agnolotti with caramelized Good Morning honey, roasted shallot, breadcrumbs. The pasta dough was made with One Degree organic flour, but chef Hotchkiss also made a special gluten-free pasta so I could also enjoy the dish – it was first time having fresh liver pate pasta, and I found it exquisite. Handmade gluten free pasta made just for me! For our main dish, Chef Hotchkiss shared his passion for pork with Pine Haven Colony roasted pork shoulder, shaved Sundog Organic Farm cabbage, Brassica Mustard reduction. I love the darker meat from a pork shoulder so I was a fan of this juicy cut. Chef Hotchkiss finished things off on a light note with a roasted strawberry bavarois. The Vital Green whipped cream dessert was topped with berries and meringue – providing a refreshing last bite to the evening. The Prairie on the Plate dinner at Bündok was the first visit to the restaurant for eight of the people who joined me that night – and all left looking forward to their next visit. My friend Marc, who works just a couple blocks away, was pleased to learn they are now open for lunch Wednesday – Friday. I also like to remind my friends who enjoy eating later that Bündok is open late for dinner – ideal for any Spaniards in your life who think eating before 10 pm qualifies as an early dinner. Bündok is a great addition to the downtown Edmonton dining scene, as was attested to by Twyla Campbell’s CBC review as well as the Globe & Mail’s review by Liv Vors who described it as out-of-sight Edmonton gem. I’d like to thank Chef Hotchkiss, along with his culinary and service team, for sharing such a delectable experience during their Taste Alberta – Prairie on the Plate dinner. Next on the list – I must come in to try your brunch!